I enjoy getting a little pancake syrup on my sausage links. I have no complaints when syrup gets on my eggs and bacon. But something sad and confusing happens when these flavors come together in McDonald's latest breakfast sandwich. Last week, I tried an egg, bacon and cheese McGriddle. 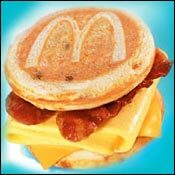 The McGimmick of the McGriddle is that the taste of maple syrup is baked into the heavy, pancake-reminiscent "griddle cakes". "Hmmmn," I thought, taking a bite. Syrup is fine with sausage... but cheese?! It was overwhelming. To make matters worse, the "maple-syrup flavor" tasted more like "flavor" than real maple syrup. There was definitely a chemical aftertaste to the sandwich. Alright, maybe I selected the wrong McGriddle. I should have known going in that a cheese and syrup sandwich wasn't for me. There were two other varieties to try. This morning, I went for the simpler version... the Sausage McGriddle... just one McDonald's sausage patty (which I always enjoy) between the new "griddle cakes". "Hmmmn," I thought, "This is still pretty bad." Anyway you slice it, the McGriddle bread is weird. The overly-heavy, maple-chemical casing had struck out twice. And in the baseball game of breakfast, two strikes mean you're out. The fact is that this is the first time McDonald's is playing God with breakfast. Until now, they had always taken existing, accepted breakfast foods and put them together to create their own breakfast foods (check out the winning sandwich they introduced last fall). The McGriddle is more the work of scientist than chefs. They have created a new food in a lab. We can only hope that in the years to come, we won't be reviewing "eggs with the taste of bacon cooked right in" or "bacon with the taste of sausage cooked right in". McDonalds realized they had a hard sell with this one. The tag lines in their commercials are proof: ""Weird. But a good kind of weird." and "Bizarre, but yummy". Maybe they could try, "Kind of gross, but won't make you throw up". Next time I'm at McDonald's and I have a taste for a little syrup on my breakfast sandwich, I'll order a McMuffin and ask for one of those little plastic syrup containers to dribble over it. The sausage McGriddle was cheaper at $1.59. $2.19 reflects the price of the egg, bacon and cheese variation. What do you think of McGriddles? Their sausage has no flavor! This is why they need to stop using processed GMO crap! They're now charging people top dollar for tasteless poison! Sausage McGriddles are $1.00 in San Jose Ca. I love them fresh and hot off the grill. They're alright, but if you're looking for something better that's also doesn't require the hassle of cooking, buy some Jimmy Dean sausage, egg and cheese croissant sandwiches at the grocery store. Much better flavor. The review needs serious revision and proper review. It is the best breakfast choice ever by McD and remains the #1 breakfast choice for McD. I enjoy BEC McG almost every morning and I remain quite healthy and fit. Definitely highly recommended. Absolutely disgusting. I tried it, ate one bite and couldn't take a second. It's now 6 days later and the smell of fake maple syrup has not left me. I'm wondering if there is fenugreek in the fake maple flavoring. McDonald's doesn't share ingredients so no way to know for sure. Fenugreek is so gross. I can't believe I actually took a bite of this horribly chemical smelling sandwich. Terrible! Made me nauseated for hours! Disgustingly delicious! Makes me sick to think about it and look at, but they taste really good. I wake up everyday and the first thing on my mind is the McGriddle! This is one of the greatest foods of all time! Enjoy one today at your local McD's. I work at McDonalds and I eat about 3 or 4 McGriddles a week. I'm in love with them as long as they are fresh out of the oven. I carelessly tried them without realizing what they are. It makes me want to renounce my American citizenship and abandon a country full of morons where ill-bred children are the tastemakers. Why not a McCandy breakfast sandwich. I know these are super bad for your health when it comes to the most important meal of the day, but I absolutely love these. I think they're sweet and savory at the same time. My favorite is still a bagel sandwich, any day, but I enjoy them. I completely disagree with the review by Not-4-Me. His 1 egg rating was basically rating his own intelligence. Did he pick something randomly and expect it to be the same as his 'regular'? Yay to those of you who actually come here to rate items for what they are, as base from expectations. I don't know why everyone loves them so much. I ate one and the sweet-and-salty taste was so overwhelming I felt bloated and extremely sick when I was done. It deserves your rating, good sir. Great sandwich! Probably my favorite of all the items available at McDonald's. Never stop making them. Disgusting!!! As you said, it's unnatural!!! Sausage egg and cheese McGriddles are my pleasure. The only thing I have against them, is sometimes the pancake patties are a bit tough. Other than that, they are the runner up to the penultimate Sausage egg and cheese McMuffin. YOU'RE INSNAE! The McGriddle is a god among mere mortal breakfast snadwiches. Best thing I've ever tasted. I've always eaten bacon, egg, mcmuffins and only had a mcgriddle far in the past. I decided to have one yesterday and it was delicious. Not very good. But at least it's edible. OH MY GOSH!! I LOVE the Mcgriddle... and the cheese combination makes it even better. The cost is a little much so I'm making them at home... GREAT. By I. M. A. F.
Such a delicious breakfast treat, it has single-handedly made me a McDonald's breakfast patron. Maple syrup (or maple-syrup substitute) combined with bacon and cheese is just wrong... plain and simple. It's not bad on pancakes with scrambled eggs though. I ordered it thinking it would be a regular bacon, egg and cheese sandwich with plain old English muffins as the buns. Well I was wrong. First bite I almost threw up. I was wondering why there was a weird sweet taste to it. Damn maple syrup. It should stay with pancakes, not bacon, cheese and eggs. So delish. Are youuu craaazy? First bite was putrid. Sickeningly sweet. Maple-esque substitute and bacon simply don't work together. I couldn't get an animal to ingest this crap. I can see why the average obese American would like this. Lol. I love the comments here at the beginning. The comedic timing is right on the ball! They are totally a mouth party indeeeeed. It's like like a party in my mouth. I don't know what you're talking about in this article because i did not notice any type of "chemical aftertaste". I love McGriddles, and obviously if I'm eating at McDonalds, I know they are not the slightest bit healthy so clearly nutrition is not why I'm eating them! This is the best breakfast sandwich in fast food today. Period. Fair review. I thought that the aftertaste was just my tongue going numb from all the flavors! I have to say, i tried my first Mcgriddle today, and it was pretty good. however i was at first surprised to notice that it looked really small, however looks can be decieving as it was particularly heavy, as i usually go for light meals...they should really consider adding it to the lunch menu or even a brunch menu. i had 2 mcgriddles (without egg) thinking that 1 might be too small for me, as i ate the 2nd mcgriddle i felt like i had just eaten one of their bigger burgers like the double big mac or double 1/4 pounder. so i figure its pretty heavy might as well just make it my brunch. but next time i will consider trying it if i over slept breakfast and i can catch the breakfast time schedule at the last minute. overrall i think i would rather stick to my regular sausage mcmuffin which i know is lighter and i like lighter breakfasts, and not too sweet and i think the flavor in each department (cheese,maple syrup, berries) is just too strong,it makes your eyes wide open. i think they may have added too much maple syrup on it. Egg & Cheese McGriddle... I do believe it is awesomeness. I just read all the comments and laughed real good. I myself happen to like the mcgriddle. Very odd combo though. The first four bites of the McGriddle are so savory and satisfying that I was content not eating the whole sandwich. The mcgriddle is one of my guilty pleasures as well. They should serve it with a mcgirdle. I haven't had one of these in months and now I know why! They are PACKED with sugar and calories and I only had the sausage McGriddle which is $2.47 (includes tax) at my local Mickey D's. Not to mention, your hand will have that sticky maple flavor after consuming it. You also get that heartburn feeling after each bite. Its safe to have some hand sanitizer and a breath mint after eating it. Eating it as a whole is weird, but it is fantastic if you eat the layers separately. I just had one today after months of deliberation. Funny how something can taste good initially and then taper off dramatically. I feel ill.... never again!!!! The McGriddle at McDonalds in B-more, MD was horrible!!!! The taste was amazing, but that McGriddle that I ate in 3 bites, was way too small! It was like the size of the bottom of a deer park water bottle. Don't waste your money on 2 inches of bread and 1/2 inch of sausage. It is not worth it!! Oh God, I want one right now they're just so good... anyway I think the combination was a really nice combo. I've always loved maple syrup on bacon so it was just a 100 times better with this. Sausage, egg and cheese McGriddles are food for the gods. I LOVE them. Can't have them as much as I'd like (I prefer to stay UNDER 500 pounds, thankyewverymuch) but man, they are awesome. When I first tasted the sausage mcgriddle, I had one everyday for 2 weeks. they are absolutely delicious. I've never tried the other varieties though. McDonald's uses real eggs, friendo. They put them in a thing that shapes them into a circle while they cook. The mcgriddle is inexplicably delicious to those who adore it. Of course, I can 100% understand people hating it, such as MrBreakfast, because it is goofy as hell. But for the rest of us, it's a delectable treat. WARNING: Upon finishing the sandwich, you will feel like you ate a greased-up baby whole. Your heart will feel like its pumping melted cheese and syrup instead of blood. In fact, you're probably cutting off a year of your life every time you subject your soul to the McGriddle. Then again... it's so damn savory. Just what is that "egg" thing McD''s uses? This McGriddle is McAwful. Too sweet and it is a very heavy thing to eat early in the morning. You will be in a food coma by 10am. The sandwich is nice but pretty heavy. Now I need to nap. McGriddles are fantastic! The only downside to them is that you're doomed to spend the rest of the day nursing your digestive system. I thought the sausage egg and cheese mcgriddle was fantastic! I'm not normally a fast-food lover and I'm afraid this may be a new obsession. I didn't realize it had mape syrup baked in when I ordered it and the aroma of maple woke me and my mouth right up! Easily the worst of McDonald's breakfast offerings. The maple syrup clashes with the "cheese", and the "folded egg" tastes like stryofoam was added for filler. They even ruined their "Big Breakfast" by switching out the scrambled eggs with this new pseudo-egg, so I blame McGriddles for that, too. Thanks, but I'll stick with the McMuffins and Hash Browns McDonald's. The sausage at McDonald''s is terrible. It has no flavor. It made the McGriddle taste even worse. I think I will just stick to the Steak, Egg, and Cheese bagel. You're entitled to your opinion but you're so off the mark on this one. McGriddles are YUM! Love 'em or hate 'em... I guess there's no in between. I got one by mistake trying to get something quick and was pleasantly surprised. I have to agree, I thought I would give it a chance as they had the 2 for $2.00. After one bite I said YUK, now Im stuck with 2 lol... Well lesson learned NO MORE MCGRIDDLE. As a self proclaimed food snob, I have to admit that I really like these things in spite of their origins. This is definitely a guilty pleasure that I refrain from often. Ah, so far I've only posted reviews of things we haven't enjoyed, but the McGriddle! I love it. The only thing on Mickey D's breakfast menu that I can stand. I get it sans cheese (who wants to eat plastic anyway?) Sausage, egg, and those McPancakes, mmmmmm. I grew up on fake "maple" syrup flavor. So real maple syrup is a little weird on my palate. Yum! I'm eating one now too! I haven't had a McGriddle in a while, I rarely eat out at Fast Food shops just because I KNOW everything is artificial and of little or none nutritional value but if I must eat something from MC'D's for breakfast I def. enjoy a McGriddle on my tastebuds the sweet and salty taste is what makes it so yummy. Everyone has their own taste on things but I think from the comments most people enjoy that mix in their foods once in a while. Yum I'm eating one now! It's McDonald's for crying out loud! It's not going to leave you feeling as though you've eaten a nutritious meal! And as far as the cheese/syrup salty/sweet contrast - that's the beauty of it! C'mon! Clearly someone has never tried dipping their french fries in a chocolate sundae! I dunno, maybe you never drink white milk with cookies either... who are you? ;) Ironically enough, I stumbled across this site in search of bread likened to that of the McGriddle hotcake! Naturally I had to leave a comment before resuming my quest. Fear not, Mr. Breakfast, one day your tastes will grow up. Until then, cheerio! 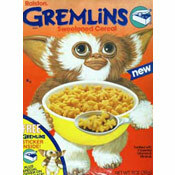 I think with the after "feeling" and the amount of fat, sodium and cholesterol I will never eat one of these again! I thought this review was harsh! I am not a fan of the chemical taste, like you find in the frozen section of the grocery store. McGriddles dont have a chemical taste at all. These are my favorite! They are so sweet and soft. The egg is great, the meat is great, and the best part is the pancake "bun". I dont like the fat though! If I eat one of these, I have to take it easy on fat the rest of the day! In my opinion, this product is awful. It's all about the sweet and the salt with a Diet Coke... YEAH!!!!! It's interesting to see how public opinion has been split on these things. I think it depends on whether your tastebuds are attuned to the sweet/salty algorithm, but if you are, this sandwich is clearly a laser-guided precision strike package aimed at your 'buds. You're correct about the "maple syrup flavor"; they engineered clever little maple syrup crystals for the griddlecake batter. They dissipate evenly under heat and leave no traces of their existence except "real maple syrup flavor." You kinda wonder if McD's tastemakers are on lease from the Department of Defense biowarfare program. In the end, like most McD's food, the bacon/egg/cheese McGriddle is truly a precision-engineered, mass produced triumph of American intellect and ingenuity. It leaves my tastebuds truly happy for about 5 mins, but the rest of my day I end up feeling (oddly enough) like Troy after the Trojan Horse dropped by. Listen scientist, I like your mcwhatever. (i laughed hard at the 'wont make you throw up part') haha. When I go to McDonald's I expect... no, I *demand* artificial stuff. And as artificial stuff goes, the Sausage McGriddle is my my default choice. You are right. They are TURRIBLE! McGriddles are the best. You're crazy! I don't know about this guy but this is one of my favorite breakfast sandwiche's in fact i'm going to eat one right now! I find this article pretty humorous. I do not go to McDonald's to get farm fresh food so the whole "chemical tasting" rant in your article is a little over stated. If you wanted the taste of fresh maple syrup baked in your sandwich it would have to cost $30 to supplement the labor cost to make them that way! I like the sandwich and I agree with Ms. Butler somedays you just want to blow your diet this would be a good start to that day. Folks, it's McDonald's a high volume fast food restaurant.. you get what you pay for! I love your reviews and generally trust them, but I stare in disbelief at this review. I'm a breakfast purist: crumpet, honey, cup of tea- maybe some yogurt and fruit, but I recognize brilliance when I taste it. Somedays you WANT to blow your diet. On those days, you NEED a McGriddle. My best friend from back in England flies 4000 miles and the first thing she says when she steps off a plane is "Did you bring the McGriddle". We've racked our brains trying to sort out how to smuggle these back to the UK. Dear God. You don't know what you have! I read this article and it's pretty funny. I just stumbled upon your site for the first time and noticed your McGriddles review from last year. I really enjoyed it and, in fact, wrote my own review (with similar results) last year. I maintain a modest baseball website but reserve a column called Foul Territory for the "everyday stuff" I like to get off my chest once in a while. You can find my McGriddles article right here.